Based in Andover, MA, California Paints is a division of California Products Corporation, an innovative manufacturer of quality paints, coatings and sports surfacing systems. California Products is a leading producer of California Paints® and Storm Stain® architectural coatings, including 2010® and Fres‐Coat® Velvet Flat, the #1 house paints as rated by a leading consumer magazine for eleven consecutive years. Committed to providing outstanding quality and exceptional color choices, California Paints is constantly seeking new innovation while keeping true to quality standards. 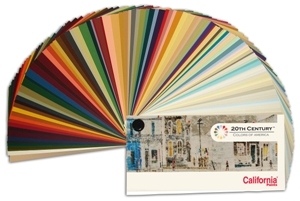 California Paints is proud to release an authentic and documented historic color program which includes their new and exclusive 20th CenturyTM Colors of America color palette. The quality manufacturer of paints, zero VOC coatings, and exterior stains has partnered with Historic New England to introduce the most authentic historic color collection ever created. Historic New England preservationists have partnered with the colorists at California Paints to provide historically accurate documentation for each color in the new palette. California Paints’ historic color program truly represents authenticity in interior, exterior, and decorative color. Historic New England is the oldest, largest, and most comprehensive regional heritage organization in the nation. They bring history to life while preserving the past for those interested in exploring the authentic New England experience from the seventeenth century to today. Historic New England has provided California Paints with supporting color documentation, including the use of color at the thirty‐six historic home museums they operate. Historic New England Preservation Specialist Sally Zimmerman states, "In creating this palette, Historic New England has drawn solely from highly relevant architectural paint sources. Our twentieth century museum properties and our archives of twentiethcentury paint and wallpaper documentation were the basis for pinpointing the actual use of these colors in the twentiethcentury home." 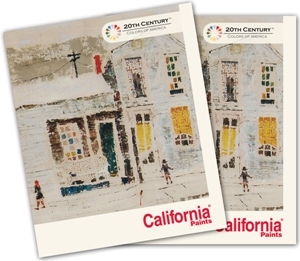 California Paints’ 20th Century Colors of America features 130 colors, including twelve off whites, and captures the vibrant tones and subtle shades of the past. Each color of the palette has its own unique and distinctive biography and includes the cultural themes that influenced its emergence in the nation’s collective color history. "The 20th century palette is a road map to recreating the past through design", says Maryellen Mantyla, Director of Marketing for California Products Corporation. "Anyone looking to replicate an authentic interior or exterior color palette referencing the architectural styles of the twentieth century can do so with ease using this collection" adds Mantyla. California Paints ensures that each historic color is accurately replicated through premium color quality and precise color reproduction. Merging authentic historic color with California Paints’ color technology allows colors from any era to be translated for present day use. The entire collection showcases 279 accurately reproduced historic colors and features the new 20th Century Colors of America and California Paints’ successful Historic Colors of America.